Since 1981, Clean Air Council has held the Run for Clean Air in Philadelphia to celebrate Earth Day. The Run for Clean Air presented by Toyota Hybrids is one of the region’s longest-running charity races and its largest Earth Day event. Located on the beautiful banks of the Schuylkill River in Philadelphia, the Run is a celebration of sustainable and healthy neighborhoods, clean air, and improvements in the region’s overall environmental health. Year after year, sponsors, volunteers, runners, walkers and families choose to celebrate Earth Day with Clean Air Council. A team of Phila Massages therapists will be on hand at the finish line offering FREE post race massages and stretching to help jump start your recovery and spring race season! What better way to cap off a 10 mile dash down Broad Street than with a FREE massage? Once you’ve made it through the finsh coral, changed into some dry clothes and chowed down on your soft pretzel, stop by the Back on My Feet tent inside the Navy Yard finish festival and treat yourself to a post-race flush from one of our wonderful therapists! Join hundreds of people on the Art Museum steps for a morning yoga flow to benefit those impacted by breast cancer. A team of Phila Massages therapists will be on site to offer free post-asana massages throughout the morning. LBBC’s Reach & Raise is a morning of connection, support and yoga for everyone—all to help raise money for the programs and services LBBC offers for those affected by this disease. With your help, we can reach even more, as we work for a world where no one diagnosed feels isolated or uninformed. Developing a self-care routine is an integral part of any training plan. Steady self-care can help improve range of motion, decrease pain and stiffness, increase your endurance, and it can help prevent common injuries. Our "Self-care for Runners" workshop will help give you the knowledge needed to create your own self-care training routine, using a small, firm ball. Over the duration of 45 minutes, we will learn some of the muscle groups involved in running, along with the actions that those groups perform. We will then demonstrate how to effectively locate and treat sore spots in these muscles on your own. To follow along on these demonstrations, you will need to bring a massage or lacrosse ball and wear some comfortable clothing! Phia Massages is partnering with members of Legacy of Hope and the Philly Runs Free campaign for a morning of fun and endurance on March 31st. Runners participating in the fund raiser will have access to our team of skilled therapists for a well-deserved post race massage and stretch following their 13.1 mile trek throughout the city. Our team of therapists will be waiting for you at the finish to help get a jump start on your recovery! The CrossFit Open is where grassroots meets greatness: From February 21st to March 25th, thousands of athletes from around the globe compete in CrossFit's largest all-inclusive event. Phila Massages is teaming up with CrossFit Manayunk on Friday, March 22nd by offering on-site massage for all of their athletes. Imagine being able to be a participate as a sports massage therapist at one of the top 10 marathons in the country, the 2018 Philadelphia Marathon! In this very unique course, our instructor, a Physical Therapist trained in France, a runner, MMA aficionado and the Sports Massage coordinator for the Philadelphia Marathon, Natacha Vidal, will discuss post-race sports massage for runners and triathletes. This course is designed to give you the skills and tools to provide Sports Massage at races, from small local 5Ks to large international triathlons. This specific course has many applications, as running and triathlon races are multiplying in the USA and worldwide, benefiting therapists and athletes alike. Therapists will get a chance to increase their experience, meet potential clients and broadcast their business, while athletes receive a pleasant treatment, rewarding them for their hard race and helping them recover faster. As an additional bonus, once the attendee has completed 10 hours of hands on training on November 17th, 2018, attendees will have the opportunity to gain 6 additional hands on hours and participate at the Philadelphia Marathon on November 18th. Bimbo Bakeries is proud to host its 4th annual Global Energy Race! On Sunday, September 23rd, 35 cities and 23 countries will join together to set families and individuals of the world in motion. Back for another year, Philadelphia joins four other U.S. cities hosting the 2018 Global Energy Race. You can find the race and festivities at historic Penn’s Landing! Phila Massages will be on site providing free post race massages and stretching to all athletes from 8am-10. CoreFitness and Legacy of Hope join together for a 24 Hour climbing marathon to benefit cancer research. The day and night-long party will set out to break a world record for longest continuous stair climbing at an outdoor venue. Our therapists will be on site with many other local vendors in support of this great cause. To keep the stair-steppin’ celebration vibes going, there will be music throughout the day and night, and every hour will be themed. Ranging from the fun and silly (costumes, milk and cookies, an 80s dance party) to the more serious (a cancer-survivor hour, a candlelight vigil), these themes will allow you to choose your own adventure during the climbing marathon. CoreFitness PHL24 is scheduled for 3 p.m. on September 20 through 3 p.m. on September 21. The 9/11 Heroes Run 5k +1M fun run/walk welcomes runners, ruckers, and walkers of all levels and of all ages to the Philly Navy Yard. The events take place all over the world, on or near September 11th, and are 100% organized by local community volunteers. It is the perfect opportunity for your community to personally come out and thank your local veterans, their families, and first responders in an annual, fun, and family-friendly environment! Join Phila Massages as we help raise awareness and honor the fallen. 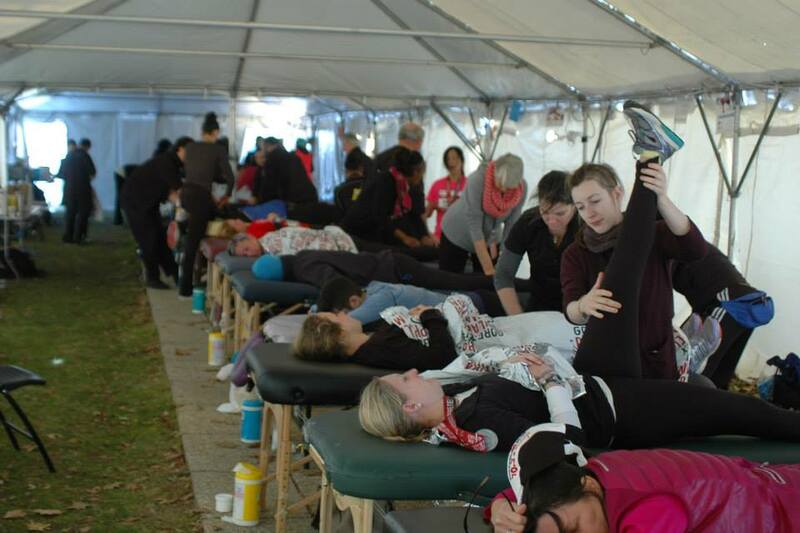 Our therapists will be at the finish line providing FREE post race massage and stretching for all runners! Put on by a group of proud and dedicated Philadelphians since 2014, the Philly 10K celebrates the history, diversity, and unique neighborhood fabric that makes each of us proud to call this city home. Swing by after your 6.2 and treat yourself to a FREE sports massage. Our therapists will be on site all morning to help jumpstart your recovery! The Beer Muscles Strongman Competition is back for another round, and this year Phila Massages will be in attendance at 2SP Brewing Company providing on site massage for all competitors! Power Plant Gym is bringing back the NAS Sanctioned - Level 1 event for the 3rd straight year. This event promises a winning combination of lifting heavy things and drinking craft beer (though not at the same time). - Arm-Over-Arm Truck Pull w/ 2SP Delivery Truck! FCR's 3rd annual River Day will be taking place at Lock 60 in Mont Clare, PA on Saturday, July 28th. The event features three swim race options; 5K, 1 mile, and 800 meters. Participants can choose 1, 2, or all 3 races and stick around for an afternoon of post race food and fun! Our team of massage therapists will be on site offering free massages from 11:30-1:30. Registration Closes Thursday July 26th, at 12 noon. The event will follow the USAT Wetsuit rule of 78º temperature threshold. Should the water temperature exceed 78º, anyone wearing a wetsuit will not be counted in the official results. Should the water temperature exceed 84º F, no wetsuits may be worn. Water temperature is likely to be above 78º in early August. This year, the Philadelphia Escape Triathlon will combine the Sprint and Olympic distance races into one day of racing through the scenic and challenging course of Fairmount Park. Phila Massages will be on hand at the finish line waiting to help you get a head start on your recovery! Our massage tent will be open from 8am-11. Experience the only swim in the Schuylkill River. Bike past the iconic Rocky Steps. Fast & flat course through Philadelphia’s Fairmount Park with beautiful views of historic Boathouse Row. Sprint distance race (750m swim, 13.1 mile bike and 3.1 mile run). Olympic distance race (1,500m swim, 25 mile bike and 6.2 mile run). Olympic distance AquaBike race (1,500m swim and 25 mile bike). Philadelphia's professional mixed ultimate team will be hosting a day-long round robin tournament in Oaks, PA where our team of massage therapists will be on site helping them recover and prep for the second half of their day. Founded in 2006, the team competes as a member of the Mid-Atlantic region in the Pro Flight of the Club Mixed Division of USA Ultimate and has gone on to have national success, including a 7th place finish at their first World Championships in 2010. Philadelphia’s inaugural Run Fest is a celebration of your running experience with Three Races, Yoga, Live Music, and the City’s greatest post-race festival. Considered the best post-race celebration around. After you grab your water and banana, the party is just getting started. Head into the finish line festival for the beer garden, free massages, food trucks, yoga sessions, live music, lawn games, selfie stations, and unique contests. A team of Phila Massage therapists will be on site offering massage from 10am-1 with the Philadelphia Flying Phoenix women's dragon boat team as they compete along the Schuykill River in the Independence Dragon Boat Race. The only Dragon Boat race in the United States run by active members of Team USA - 2007 and 2011 World Champions! Teams schedule up to THREE practices, coached and steered by members of Team USA! We'll teach you how to hold the paddle, the stroke, everything. We provide the boat, the paddles, the life vests. Each boat on race-day will be steered by a member of the US National Dragon Boat Team. Your team will have a reserved space along the river to watch and relax between your races. Rent a tent or bring your own. Bring a grill, and have an all-day tailgate! You'll race three times (qualifier, semi, final): 500 Meters per round. Women's, Mixed, Men's, Military, Media, Mummers - we have divisions for everyone! Treat yourself to a post race massage after trekking 10 miles down Broad Street with over 40 thousand of your closest friends. Our therapists will be set up inside the Back on My Feet tent inside the Navy Yard finish festival from 8:30 to 11:30 offering free post race massage and stretching to all participants. The 2018 Blue Cross Broad Street Run Lottery will open on February 1, 2018 and close on February 16, 2018 at 11:59 p.m. EDT. Results of the lottery will be announced by Tuesday, February 20th. Celebrate Earth Day with a race down the banks of the Schuylkill River followed by a post race massage at our post-race massage tent. Three therapists will be on site near the finish line helping to jump start your recovery! The Run’s start, finish, staging area and Earth Day Celebration are held on MLK Drive, right next to the Philadelphia Art Museum. This picturesque location provides an ideal space for activities, sampling, exhibiting, and fun. Attendees can enjoy a free post-race drink and eco-snacks donated from our partners. The Run Kids’ Corner includes eco-friendly make-and-take crafts and education. The Run creates a celebratory atmosphere for this engaged and active audience to learn more about companies committed to the environment and health. Come out to the Belmont Plateau on April 14th for the first ever Back on My Feet Philly Style 8K! Our therapists will be on site from 9am-11 offering FREE post race massages to all runners! The Philly Style 8K is the premiere fundraising race for Students Run Philly Style, the only program in Philadelphia that transforms students' lives through long distance running and mentorship. When participating in this race, runners have the unique opportunity to experience Students Run Philly Style up close as over 1,000 Students Run Philly Style youth will be running! Founded in 2004, Students Run Philly Style has created a movement of healthy young people in Philadelphia — a movement­­ that has touched multiple generations of families and measurably impacted the lives of its participants. We pair students with caring adult mentors and ask them to achieve a seemingly impossible goal: run 13.1 or 26.2 miles. Students and mentors train side-by-side, creating meaningful relationships over hundreds of training miles. Youth are empowered as they overcome the challenges of long distance running, ultimately achieving their goals at the finish line and transferring that empowerment to other parts of their lives. For decades high school, collegiate, and competitive runners have battled on the Belmont Plateau cross country course in Philadelphia's West Fairmount Park. Expect a mixture of single track, gravel path, and grassy field trails as you ascend and descend the hills of the Plateau. The elevation changes and non-paved terrain provide a fun challenge and a unique experience on a course that very few have the opportunity to race! Come with a spirit of adventure and a sense of humor--break up your Blue Cross Broad Street Run training with a jaunt through the woods. There will be a water stop along the course, port-a-potties at the start/finish, and an ambulance on site. Join Phila Massages and the hundreds of area runners for a five mile race along West River Drive. Our therapists will be offering free post race massage and stretching near the finish area as you refuel and recover around the multiple Philadelphia food trucks. Online registration closes at noon on March 22nd. Registration will be available at Packet Pick-Up on March 23rd at Philadelphia Runner University City and Center City as well as on race day. You trained for months! The day has come when all your hard work will pay off. Once you cross that finish line, get a jump start on your recovery by visiting our team of skilled therapists for your FREE post race massage. We will be on site inside the finish festival from 9:30-1:00. In Philadelphia, we redefine the experience of what a marathon should be. A beautiful course, an engaging atmosphere—it’s no wonder we're consistently listed among the top ten courses in the country, recognized for our flat terrain, mellow weather and spirited fans. For the second year in a row, the Philadelphia Marathon will be held on Saturday of race weekend. Conquer the newly designed 13.1 mile course through the neighborhoods of Philly and when you make it back to the parkway, visit our team of skilled massage therapists for your FREE post race sports massage! We will be on site from 8:30am-12 at the giant massage tent inside the finish festival grounds. Have the best time of your life completing 13.1 challenging miles that wind through Philadelphia’s most scenic and historic neighborhoods. From the history-steeped streets of Old City, through one of the liveliest stretches of Center City, across the Schuylkill, up through the bucolic trails of Fairmount Park, and back down to canvas the banks of the river. The course is also sanctioned by USA Track & Field. The Half Marathon was added to Race Weekend in 2006 and has seen an increase in runners every year since. Whether as a test-run for first-time marathoners or as a challenging race along a scenic route, the Half Marathon has given thousands of runners the opportunity to take on the Philadelphia Marathon on their own terms. Imagine being able to be a participate as a sports massage therapist at one of the top 10 marathons in the country, the 2017 Philadelphia Marathon! As an additional bonus, once the attendee has completed 10 hours of hands on training on November 11, 2017, attendees will have the opportunity to gain 6 additional hands on hours and participate at the Philadelphia Marathon on November 18 and/or 19. Natacha will have a sign-up sheet at the November 11 seminar for attendees to sign up for the race day of their choice! What better way to spend a Sunday than running a 5K, playing with puppies and FREE massages? Come out to the Navy Yard on September 24th to benefit The Monster Milers at the 5th annual Rescue Run 5K. We will be on site from 10:30-12:30 to assist in your recovery! The Rescue Run 5Kis Philly’s first race to benefit and promote rescue and adoption. Annually in the Fall, hundreds of runners gather at the Navy Yard to race in honor of the dogs we love so much. Numerous rescue groups and shelters attend the Rescue Rally following the race. Racers, spectators, family and friends are able to meet furry friends for adoption and get more information about volunteering with local animal shelters. Proceeds go to continuing the mission of The Monster Milers, Philly’s shelter dog running and rescue, 501c3 non-profit volunteer group. You in? Register today. Join Phila Massages as hundreds of runners take to the streets of south Philly! Therapists will be waiting at the recovery area to offer FREE post race massages from 8-10:30. Philadelphia Brewing Company will have taps flowing at full speed pouring cold beer for everyone and Shake Shack will be mixing Federal Donuts and custard together for a special Philly 10K creamy cold concoction. There will be music, awards, and a couple little surprises waiting as well. New in 2017: Runners can check in prior to the race next to the bag check tent on 4th St between South and Bainbridge to get their Post-Race Party wristband.